It seems that the mayor of Mobile, AL is set on annexing the entire county into the city. He is doing it piecemeal since annexation has never went over well outside the city limits. Some say this is gerrymandering and that makes it illegal. Whatever the case may be, Mobile is annexing at an alarming rate. Property taxes for those annexed will go up considerably. I’m not sure they have taken that into consideration when the idea of city services were flashed in their faces. I’m against annexation for a myriad of reasons. I confess the main reason is increased taxes. The major has said they will not increase taxes for five years on newly annexed areas. But, here’s the kicker; how is the city going to pay for all those city services to the newly annexed areas for the next five years? They either are going to increase taxes on people already living in the city or set aside that deficit for five years and hit the newly annexed areas with it. It’s a tangled web in this city. I watched the Texas-Oklahoma football game this past Saturday. I’ve got to say that was one of the best football games I’ve ever seen. It was a shame someone had to lose. I fully expected Oklahoma to win. But, Texas QB Colt McCoy proved to be the difference in this game. He may well be the best college QB in the nation. Sad to say, college football season is halfway over now. I love this time of year. There is a homeless man that “lives” behind a health food store a couple of miles from where I live. I am an early bird and I always see him pushing his shopping cart (with everything he owns inside that cart) to the Wal-Mart Superstore directly across from the health food store. The Wal-Mart management lets him stay in the lobby for a few hours each morning. He is always cleanly shaved, washed and very neat. He seems very intelligent, sociable. He eats his breakfast there in the entrance lobby of Wal-Mart, never speaks to anyone and then takes off for the day. 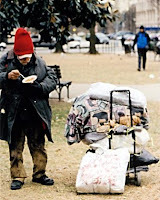 My heart goes out to him and any homeless person. But, despite Wal-Mart’s cold, heartless image, I give them credit for allowing this man to at least get out of the heat of the day and for giving him a warm breakfast. 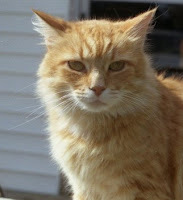 Finally, it is with great sadness I must report that the feral cat that had taken up residence at my house, is missing. “Old Yellow,” as I had affectionately named him in a post a couple of months ago, has not been around for about two weeks now. I have asked neighbors if they have seen him and no one can even say for sure the last time they saw Old Yellow. For the longest time Old Yellow would not even come near me. One morning, as I was about to go to breakfast, he jumped down from my truck and purred around my legs like he was an old friend. As I said in my blog entry about him, he appeared up at my place, gaunt and malnourished. I figured he wasn’t going to leave. So, I couldn’t let him starve. I started leaving him food and he pretty soon started getting stronger and bolder. He made several meals off of squirrels and birds. The squirrel population has diminished quite a bit since he took up residence here. Old Yellow had even gotten used to my beagle, Ralph, barking at him. I’m worried about him. Wherever Old Yellow is, I hope he’s ok…and doing fine.